The NFL is now littered with former Texas players from the [tag]Mack Brown[/tag] era. It seems like every game involves a Longhorn in the starting lineup. The biggest impacts appear to be on both lines and in the secondary while linebacker is without a doubt the weakest position. Injuries affected a few of the players 2008 season, but the program should be proud of what these guys are accomplishing. [tag]Justin Blalock[/tag] – The Atlanta Falcon’s made the playoffs behind a great running game and solid quarterback play. The unsung unit on the team was the offensive line. Blalock has cemented himself as a starter on an upcoming team by starting all 16 games after playing in 14 last season. At Texas, Blalock played tackle, but in the NFL he has been able to slide back to his natural position of tackle. Blalock was even able to score a touchdown on a fumble recovery. [tag]Tarell Brown[/tag] – The forgotten member of the 2005 secondary has become a solid nickel corner in the NFL for the 49ers. Brown played in 15 games and started in one. He recorded 30 tackles and two interceptions. [tag]Cedric Benson[/tag] – The beginning of the season didn’t appear good for Benson. After being cut by the Bears it appeared no one would request his services. The Cincinnati Bengals fell apart and came calling four games into the season. Benson started 10 games, gained over 700 yards, and scored two touchdowns on the ground. He also added 20 receptions. “EL Ced” finished with two huge games; making the chance he is offered a longer deal by the Bengals a real possibility. [tag]Tim Crowder[/tag] – Crowder struggled with injuries and the depth chart all season. He played in six games, starting zero, and recording one tackle on the whole year. [tag]Jamaal Charles[/tag] – Charles had a rookie season that has to be seen as a success. Charles sits behind Larry Johnson on the depth chart, but made plays when given the opportunity. The speedster averaged 5.3 yards per carry and added 27 receptions. His only touchdown of the season came on a reception. If Johnson isn’t retained by the Chiefs, Charles may get a look as an every down back. [tag]Leonard Davis[/tag] – The offensive line for the Cowboys underachieved this season. Davis will go to another Pro Bowl but o-line selections are based on reputation more times than not. It was not all Davis’ fault but he did not perform at the level he did the previous year. [tag]Phil Dawson[/tag] – Dawson was once again a lone bright spot for the Cleveland Browns franchise. He went 30/36 with a long of 56. He was perfect on extra point, but the 18 attempts magnify the struggles of the Browns offense. [tag]Derrick Dockery[/tag] – Dockery is one of the higher paid linemen in the league, but is never as dominant as his salary would warrant. [tag]Jermichael Finley[/tag] – Finley had a hard time getting started this season. He ended up playing in 14 games while starting one of them. The rookie finished with 6 receptions for 74 yards and a touchdown on the season. [tag]Cedric Griffin[/tag] – Griffin has turned into a solid starting cornerback for the Vikings. He gets a lot of action playing opposite of Pro-Bowler Antoine Winfield but holds his own pretty well. Griffin plays with excellent enthusiasm and competitiveness which makes him an eager corner in run support. He played in all 16 games for the second straight season and recorded 91 tackles and a pick. [tag]Mike Griffin[/tag] – Michael Griffin had the type of year that have made many hail him as the best defensive back to come out of the 2005 group. Griffin is a Pro-Bowl alternate after recording seven interceptions and a sack on the year. He is quickly becoming one of the best safeties in the league. His play has allowed the Titan defense to become one of the best in the league. Griffin also returns kicks for the #1 seeded Titans. [tag]Ahmard Hall[/tag] – The former Marine has established himself as one of the last true fullbacks in the game. The Tennessee running game is one of the best in the league behind the duo of Chris Johnson and Lendale White. The two split carries with mirrored success, and the one constant is the presence of Hall. He has also become a weapon in the flat out of the backfield, recording two touchdown receptions this year. [tag]Casey Hampton[/tag] – Hampton had a tough season as he struggled to get on the field with health and conditioning problems. When Hampton can play he remains the best 3-4 nose tackle in the game. He recorded one sack in 13 games that he was rarely able to make it all the way through. [tag]Michael Huff[/tag] – The Thorpe award winner hasn’t lived up to his draft status so far in his career, but it is still early. Huff lost his starting job and didn’t record a sack, interception, or forced fumble on the year. [tag]Quentin Jammer[/tag] – Jammer had another great year in San Diego. He is one of the most physical corners in the league and continually gets matched up with the opposing team’s biggest and best receiver. Jammer recorded 88 tackles, two interceptions, and three forced fumbles for the playoff bound Chargers. It has been amazing to watch the turnaround of Jammer’s play after struggling for the first few years in the NFL. The pressure of being a high pick has subsided and Jammer’s play has risen. [tag]Derrick Johnson[/tag] – DJ has moved inside and performed well for the Chiefs. The knock on the former Texas star coming out was his unwillingness to take on blocks, and after a few years as a pro the criticism still exist. When playing in space he excels, but at the point of attack he has remained a liability. Johnson has been up and down, but has shown flashes of potential. He ended the year with 85 tackles, 1.5 sacks, one interception, and four forced fumbles. If/when the light turns on for DJ the sky is the limit. [tag]Frank Okam[/tag] – Okam may have earned himself a roster spot for next year with his play down the stretch. He lacks the motor and intensity most coaches want out of an interior defensive lineman, but he has the tools to become a solid player in the league if he ever turns it on. [tag]Cory Redding[/tag] – I feel bad for Cory Redding. I feel bad for any player, coach, trainer, and journalist (except Rob Parker) in Detroit. Redding was the heart and soul of their defense (if that is possible), and if he ever gets out of Detroit he may have a chance to make some noise. Until then, he’ll be rich in Detroit. He got three sacks on the year. [tag]Brian Robison[/tag] – Robison plays behind Jerod Allen so his snaps are limited. When he is on the field he shows up and makes plays. He managed 2.5 sacks and a forced fumble in 15 games. [tag]Shaun Rogers[/tag] – Shaun Rogers is the most disruptive interior lineman in football today. The guy is just huge and unstoppable when his motor is turned on. He took over games at points this season in spite of double and triple teams. Rogers will be in the Pro-Bowl again after turning in 76 tackles and 4.5 sacks. He has Hall of Fame type talent when it is all clicking for Rogers. [tag]Aaron Ross[/tag] – He may not be the best athlete in his marriage, but the Thorpe award winner has become a better than average cornerback in a tough place to play. Ross started in every game he played, 15, and grabbed 3 interceptions, including one that he returned for a touchdown. Ross has the ability to be a shutdown corner as his technique and confidence continue to grow. [tag]Bo Scaife[/tag] – Scaife has emerged as a very productive tight end even in the face of losing his quarterback and his team bringing in a big name free agent in Alge Crumpler. There were a few games where Kerry Collins completely forgot about Scaife, but he finished with 58 receptions and two touchdowns. Scaife has also become better as a blocker which allows him to stay on the field in all situations. [tag]Lyle Sendlein[/tag] – People tend to forget about Sendlein when discussing the better offensive lineman Mack Brown has put into the NFL. Sendein has started every game of the season for a playoff team. Not too bad. [tag]Chris Simms[/tag] – Simms is the number three quarterback on Tennessee’s roster. [tag]Kasey Studdard[/tag] – Studdard remains a reserve lineman for the Houston Texans. He hasn’t been able to crack the starting lineup. [tag]Limas Sweed[/tag] – Sweed is listed as the 4th receiver on the Steeler roster. One would think Sweed will contribute more after a full off season. [tag]David Thomas[/tag] – The Patriots use a lot of tight ends in their offense, so none of them have numbers that are going to blow you away. Despite that Thomas has been able to get on the field a lot so far in his career. He pulled in nine receptions for 93 yards, but was never able to reach the end zone. [tag]Nathan Vasher[/tag] – Injuries rendered the 2008 season a wasted one for Vasher. He played in eight games, recording one interception, before being placed on injured reserve. 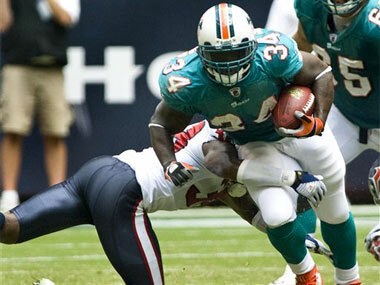 [tag]Ricky Williams[/tag] – The former Heisman trophy winner and league pariah has made his comeback has a productive back in the Miami system. He was one of the many bright spots on a team full of them this year. Williams is able to make plays without being relied on to carry the full load because of the presence of Ronnie Brown. Ricky scored four touchdowns on 659 yards rushing. He may have made his biggest impact as a receiver out of the backfield where he averaged over seven yards a catch on 29 receptions. [tag]Roy Williams[/tag] – The losing ways of the Lions followed Williams from Detroit to Dallas. Roy was never able to make an impact for the Cowboys for reasons that still remain unclear. He has proven to have the ability which leaves work ethic and injury as the two other reasons for his lack of production. Williams has unfortunately been criticized for both a lack of work ethic and inability to stay healthy in his career. He will need to have a huge year next year to justify the trade and contract Jerry Jones awarded him. [tag]Selvin Young[/tag] – Young was another Longhorn that struggled with injury. Denver is notorious for alternating backs, and with the addition of injuries Young was never able to stay on the field. When he was healthy he produced so it will be interesting to see what the new coach in Denver decides to do with Selvin. [tag]Vince Young[/tag] – 2008 was not a good year for VY. The greatest player in Longhorn history lost his job after one game and a knee injury, and never was even given the chance to win it back. It now appears Jeff Fisher made the right choice as Tennessee earned the #1 seed in the AFC. While they did it with defense and running the ball, Collins has done a good job in a Trent Dilfer type role. This season may end up being the best thing that has ever happened to Vince as a professional if he uses the experience in the right way. [tag]Tarell Brown[/tag] – The forgotten member of the 2005 championship secondary has found a place as the nickel back in San Francisco. Tarell had two tackles and a pass breakup this weekend versus Philadelphia. [tag]Cedric Benson[/tag] – Benson had a slow game in his second game back in the league, only carrying the ball four times for six yards. He appears to be the most talented back in the Bengals backfield, but until he learns the playbook the snaps will be limited. [tag]Justin Blalock[/tag] – His Falcons continue to win, this time on a late second field goal against the Chicago Bears. Blalock and his fellow lineman have protected rookie Matt Ryan and opened holes for Michael Turner consistently this year. The combination of Blalock and rookie left tackle Sam Baker makes the Falcons left side of the line one of the better young groups in the league. [tag]Tim Crowder[/tag] – Crowder recorded no stats against Jacksonville. [tag]Leonard Davis[/tag] – The Cowboys and their running game continue to struggle. Davis had a personal foul penalty at the end of the loss against the Cardinals. The offensive line must play better for the Cowboys to win and Davis is a huge part of that. [tag]Phil Dawson[/tag] – Dawson went two for three on field goals with a long of 28 and three for three on extra points in the Cleveland win Monday night. [tag]Jermichael Finley[/tag] – Did not play this week for Packers. [tag]Cedric Griffin[/tag] – The corner recorded seven tackles in the ugly win against Detroit. The Vikings secondary played well, not allowing the Lions to record a touchdown. [tag]Michael Huff[/tag] – Huff’s Oakland secondary was torched by Drew Brees this weekend. The former Thorpe Award winner had three tackles on a day he’d like to forget. [tag]Quentin Jammer[/tag] – Jammer had a huge day in the Charger win over the Patriots. He recoded three tackles, an interception, and five pass defended while matched up most of the night against Randy Moss. Jammer has come on in the past few years becoming one of the more physical corners in the league. [tag]Brian Robison[/tag] – Robison didn’t record any stats in the Viking win over the Lions but he did get on the field on a good number of snaps. [tag]Shaun Rogers[/tag] – Rogers had his best game of his young Browns career on Monday night. He only recorded two tackles but clogged up the middle and applied pressure on Eli Manning all night. [tag]Lyle Sendlein[/tag] – Sendlein has found himself starting at center this year for the Arizona Cardinals. He had a decent day matched up against Cowboy nose tackle Jay Ratliff. His Cardinals pulled the upset in overtime on a blocked punt. [tag]David Thomas[/tag] – Thomas caught his first ball since week three. The catch went for 13 yards. [tag]Nathan Vasher[/tag] – Vasher missed another game with an injury. [tag]Ricky Williams[/tag] – Ricky Williams found the end zone for the first time this year on Sunday against the Texans. Ronnie Brown has taken over the number one running back spot, but Ricky has found a niche in the offense and should continue to get 10 plus carries a game. He finished the game with 11 carries for 46 yards and two receptions. [tag]Roy Williams[/tag] – Roy Williams and the Lions had a horrid offensive game against the Vikings. Williams had two receptions for only 23 yards. This has been a very disappointing season for Roy and the recent talk may have him being traded before the season is over. [tag]Selvin Young[/tag] – Selvin didn’t play this week for the Broncos. It is hard to know if it was actually for injury or due to play on the field. Lyle Sendlein to start at center Sunday for Arizona Cardinals. The Texas rookie will get a big chance to play for him hometown team. How does this year’s team compare? Comments Off on How does this year’s team compare? OL – Big improvement over last year. Best tackle tandem in the nation and a ton of attitude from the guards. We lose Jason Glynn but [tag]Lyle Sendlein[/tag] should be a very capable replacement. QB – [tag]Vince Young[/tag] will be better in every facet, depth is much worse and scary as hell. Young must reduce his mistakes. If he can cut his interceptions in half this year (he had 10 last year), the Longhorns’ offense will be tough to stop. TB – Pretty big drop off overall but I think statistically they’ll still be pretty good. Will they be able to get the difficult yards against the OSU’s and OU’s of the world? I expect big plays out of [tag]Ramonce Taylor[/tag] and [tag]Jamaal Charles[/tag] that could really break open some games. FB – Worse at lead blocking and therefore will be de-emphasized. Still serviceable though. I think the position will be back next year (with Marcus Myers, [tag]Chris Ogbonnaya[/tag], and Michael Houston) and will be more versatile than we’ve seen in the past. TE – Improved in single TE sets with [tag]David Thomas[/tag] having an All-American season, and improved blocking when [tag]Neale Tweedie[/tag] is in there. Pass-catching threat out of 2 TE sets will be down, especially early in the year as true freshman [tag]Jermichael Finley[/tag] gets acclimated. WR – Up a notch from last year’s group, but that isn’t saying all that much. All the young guys have improved (some obviously more than others, especially [tag]Billy Pittman[/tag]) and the more time a QB and his WR’s get together the better. The additions of a hopefully healthy [tag]Jordan Shipley[/tag] and a quickly improving [tag]Quan Cosby[/tag] could be huge. DL – A lot better if [tag]Larry Dibbles[/tag] is with us (academic eligibility rumors are swarming) but I’m excited by the idea of a healthy [tag]Rod Wright[/tag] and [tag]Frank Okam[/tag] together. Starting ends should be improved and the backups should be able to contribute to the pass rush. LB – Big improvement at two spots and an even bigger drop off at the other. More blitzing and more sacks, but fewer turnovers forced unless converted safety [tag]Drew Kelson[/tag] goes INT crazy. You can’t expect to replace Derrick Johnson but overall I think we’ll all be very happy with the play out of these three spots this season. DB – Corners are improved and safeties will be by the end of the year. Mike Griffin needs experience but he’s got the potential to be better than Phillip Geiggar was last year. We need sure tackling from the entire secondary and to limit our stupid decisions. More pressure on opposing QB’s from the front seven will make their job much easier. Depth is some of the best in the country. FG/XP – Yikes, everyone has struggled this fall in practice. Whoever is doing the kicking needs to make a few kicks in the early weeks to build some confidence. Kickoffs – A healthy [tag]Richmond McGee[/tag] should mean more touchbacks and more kicks into the right zone. Better coverage because the overall depth of team means better athletes on the coverage teams. Hopefully all the talk of more emphasis on this facet from the coaching staff wasn’t just lip-service. Kick Returns – Every kickoff should be exciting with Taylor back there. How much will [tag]Tarell Brown[/tag] provide if teams kick away from Ramonce? Might see one of the younger guys back there deeper into the year. I expect Cosby to make an appearance at one of the return slots sometime early in the season and it’ll be interesting to see what he’s capable of. Punting – McGee has gotten better every year and there’s no reason that should change. Hopefully he won’t have to do it very often. Punt returns – Selvin Young back there should mean fewer fair catches and more big plays, but I’ll be worried about his health everytime too. I don’t want Ramonce back there right now, he scared the crap out of me everytime last year. Get him some returns in mop up time so he’s ready to tear it up next year. Anybody think Pittman deserves a chance to show what he’s got? Almost every spot is either improved or equal to the talent we had on the field last year, so overall we should be a better team. You can’t lose guys like Cedric Benson and DJ and expect to hit the ground running the next season, but that doesn’t mean this team isn’t capable of big things. We’re relying on a lot of young talent and have a huge test early in the year, so the success of this team will hinge a lot on how quickly those guys can become ballplayers. I’ll post my national and game by game predictions later this week.